One of the things that I love about autumn is the possibility of eating some of my favorite veggies finally in season like artichokes, broccoli, celeriac and of course pumpkin. I love roasted pumpkin, pumpkin risotto and of course pumpkin soup. But every year I try to make something different from my usuals; a couple of years ago I made a delicious Pumpkin Spice Jam and this year I decided to make a classic: Pumpkin Ravioli. 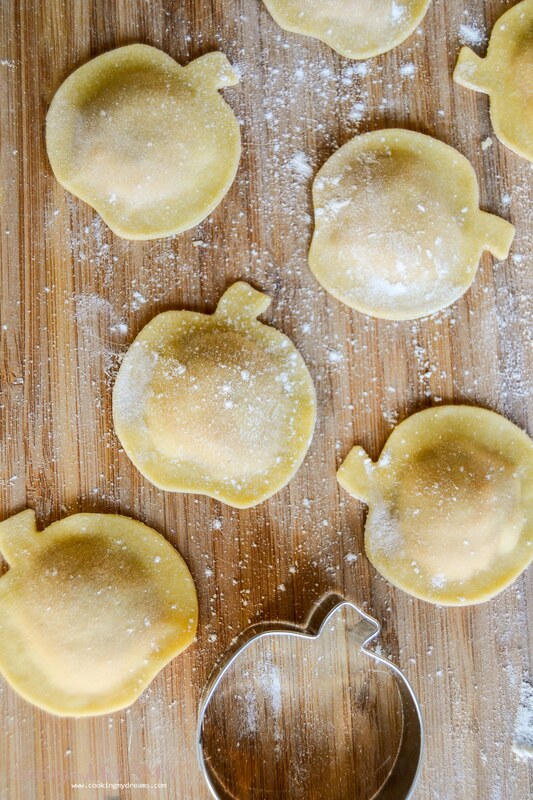 It starts by roasting the pumpkin as usual, so you can roast the whole pumpkin for dinner and with the leftover you can make these ravioli the day after for lunch for example. In Italy I usually buy the classic Cinderella pumpkin (zucca gialla). It’s the most common and the best for soup and risotto. It has soft flesh which becomes easily creamy and a subtle sweet flavour. When I moved to The Netherlands, however, I started eating a lot of Butternut squash. It’s difficult to find in some areas of Italy and I always wanted to try it because I saw it in many recipes. The taste is similar to the Cinderella pumpkin but it’s easier to cut and a little bit sweeter; so I started using Butternut for all my recipes. Hokkaido pumpkin is rich in vitamins and contains minerals such as: calcium, magnesium, phosphorus, potassium, beta-carotene and vitamins A, B, C. Hokkaido Pumpkin is a real vitamin bomb. The healing effects of this pumpkin are miraculous. It helps heal diseases of the pancreas, spleen and stomach problems, but it also helps ease disorders of kidneys and heart problems. It has diuretic effects and its ingredients can expel nematodes, pinworms and roundworms. Eating Hokkaido pumpkin is also very suitable for diabetics; roasted seeds help ease men’s problems with the prostate. Hokkaido pumpkin is suitable as part of the diet in reducing diets for its low energy content, high contents of fibre and detoxifying effect. Read more about Hokkaido pumpkins here. 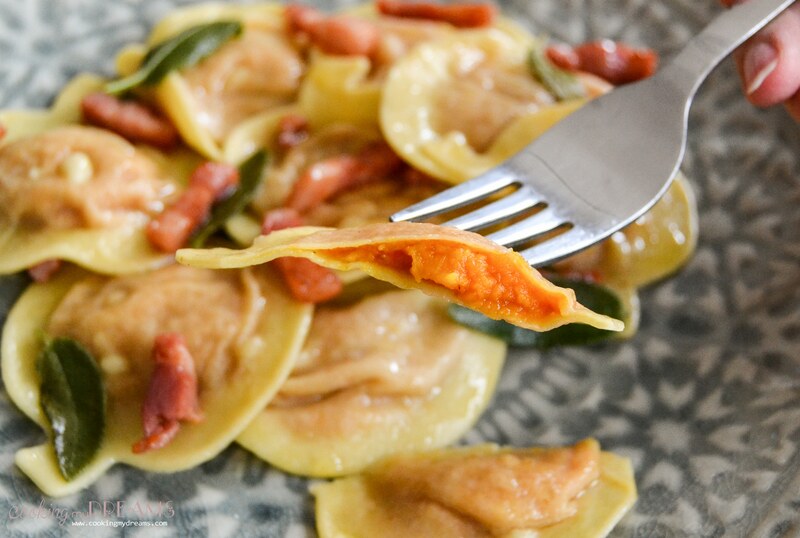 I like the classic ravioli shape but I always try to make different shapes to get a little whimsical. From the simple circle shape, to mezzelune, cappelletti, or even using cookie cutters like in this case. I have some Halloween cookie cutters so I decided to use the pumpkin shape to cut my ravioli. The important thing is to use a shape that leaves enough space for the filling. Another important thing to remember when doing filled pasta, is to roll the dough quite thin so that it doesn’t become too thick where it overlaps but also not too thin to avoid breaking when boiling. When you eat a ravioli you need to taste clearly the filling but the pasta should also still have a bite. Cut the pumpkin in slices (not too thick), remove the seeds and lay them on a baking tray lined with foil or parchment paper. Drizzle with the olive oil and sprinkle the herbs, salt and pepper evenly. Add the garlic and bay leaves then toss well with your hands so that all the slices are well coated with the seasoning on both sides. Bake for about 20 minutes or until soft. While it's baking, prepare the pasta dough mixing the two flours. Add a pinch of salt, mix and make a hole in the center, add the eggs and whisk them with a fork while slowly adding the flour until it becomes really sticky. Knead the dough with your hands and add a little bit more flour if needed. When the dough is smooth and not sticky anymore, cover in pastic wrap and set aside to rest for about 10-20 minutes. 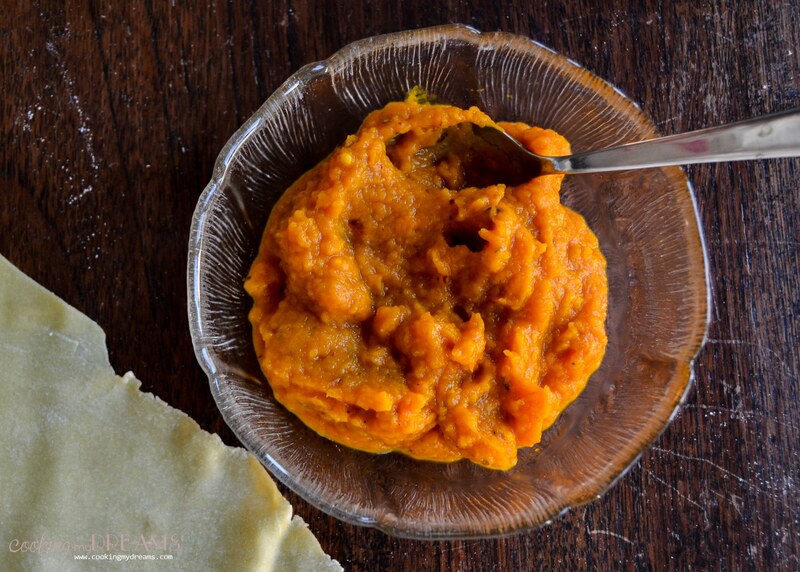 When the pumpkin is cooked, remove the peel and blend (without the bay leaves) until smooth. Set aside to cool down. Cut the pasta dough in 4 parts and start by kneading one on a cutting board sprinkled with flour. If you use a pasta machine, roll the dough at the thickest setting a few time folding it on itself so it becomes more stretchy. Roll the dough thinly and place it on the board. Sprinkle with flour everytime it needs it. With a teaspoon or a sac-a-poche dot the pumpkin filling leaving enough space to cut the ravioli shape (you can use the cutter as reference). With a brush wet the pasta around the filling and then place the other pasta sheet on top. Carefully press with your fingers around the filling to remove the air and stick the two pasta sheets. 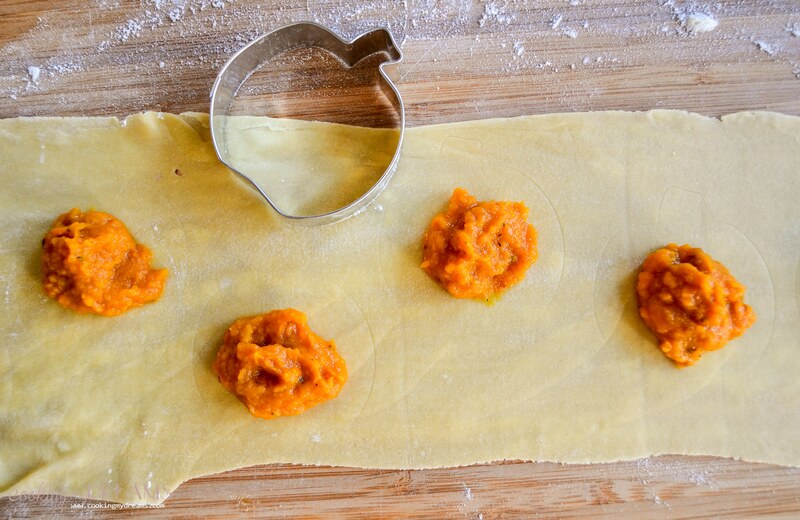 Cut the ravioli with a knife or cutter and set them on a clean towel to rest. Bring to boil a large pan of salted water and meanwhile in a large pan fry the bacon strips and when crunchy turn the heat to low and add the butter and the sage leaves. Drop the ravioli in the boiling water and cook for 2-3 minutes. Carefully drain the ravioli and add them to the pan with the condiment. Toss to coat the ravioli well and serve immediately with some Parmigiano Reggiano grated on top. Sono meravigliosi!! E che bella l’idea di farli a forma di zucca! Bravissima! !